—I immediately lost my Metrocard again and couldn’t find it. —I woke up Saturday morning (my very last day without dental coverage) with an infected wisdom tooth. I then spent all day trying to find a dental urgent care that could see me, but they were all full. I ended up getting a prescription for antibiotics called in from my old dentist to take care of the infection before I get the tooth pulled later this week. —Notre Dame basketball lost to (unranked) Pitt. —We had a snow/sleet/ice storm that had none of the hype of last week’s blizzard but caused a lot more actual problems. 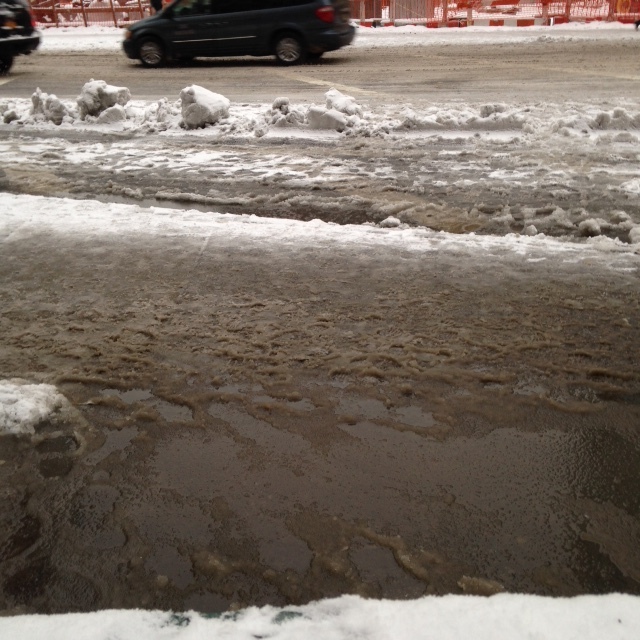 The icewater puddles that are currently scattered throughout every sidewalk soaked through my snowboots this morning, and the areas that are not icewater puddles are still icy and slippery. More importantly, the subways are majorly delayed, and a few trains in Queens got stranded for hours this morning. But I went to work today, and I left early to avoid being stranded on my subway commute home, since apparently there’s a flash freeze warning tonight. I’m home now, in hibernation mode. On the bright side, there is banana chocolate chip soy ice cream in my freezer. Here’s hoping the groundhog is wrong.